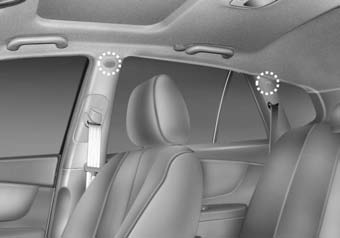 Curtain air bags are located along both sides of the roof rails above the front and rear doors. They are designed to help protect the heads of the front seat occupants and the rear outboard seat occupants in certain side impact collisions. 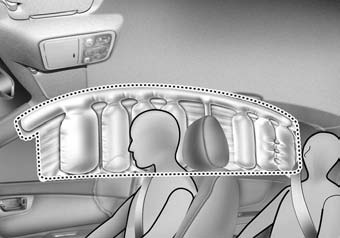 The curtain air bags are designed to deploy only during certain side impact collisions, depending on the crash severity, angle, speed and impact. The curtain air bags are not designed to deploy in all side impact situations, collisions from the front or rear of the vehicle or in most rollover situations. Do not allow the passengers to lean their heads or bodies onto doors, put their arms on the doors, stretch their arms out of the window, or place objects between the doors and passengers when they are seated on seats equipped with side impact and/or curtain air bags. Never try to open or repair any components of the side curtain air bag system. This should only be done by an authorized Kia dealer. There are many types of accidents in which the air bag would not be expected to provide additional protection. These include rear impacts, second or third collisions in multiple impact accidents, as well as low speed impacts.